directors discuss 2013 and the year ahead. 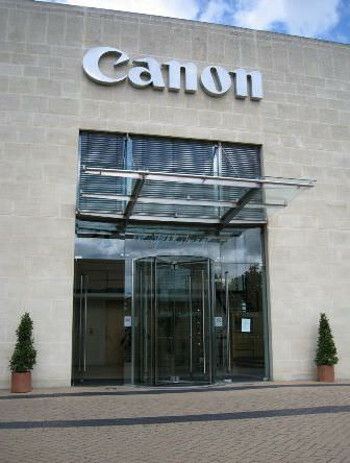 Canon Woodhatch HQOn 1st May 2013 it was announced that Canon had completed its integration of the Océ business in the UK and Ireland. Four key individuals in the organization came together to discuss and give their views about what this all means going forward towards 2014 for professional print customers in the UK and how does the newly combined organisation now operate? Under the banner, ‘Stronger together’, Canon said that it now has an unrivalled product and service offering within Wide Format Print, Commercial Print (Continuous feed), Professional Print (cut-sheet) and Business Services, and all four of these divisions now interconnect to support customers in finding the best solution to support their requirements. The individuals involved are the Marketing Directors for these four Canon UK divisions, Richard Turner - Wide Format Group, Chris Aked - Commercial Print Group, Mark Lawn - Professional Print Group, Mike Bianchi – Canon Business Services. In a joint interview they explain Canon’s strategy going forward. Following integration, what can customers now expect from Canon? Mark Lawn: The primary aim of the integration was to create a single combined organisation, with the vision to become the global leader in print technology and solutions. The breadth of Canon’s portfolio is now unrivalled by any other manufacturer within the industry and, regardless of our customers’ requirements; we’re in a stronger position to support them. However, that means nothing if you don’t have the expertise and knowledge available to understand and support the end customer. Chris, Richard, Mike and I now work closely alongside one another to share ideas, knowledge and expertise from across each of Canon’s core professional print markets. This collaboration and knowledge sharing process is essential in helping us to understand and meet the evolving wants and needs of customers as they look to grow their business, ultimately making Canon a stronger and more capable organisation. As with any integration of this size, there have been challenges along the way, but by being firmly focused on the future and keeping the customer at the heart of our business, we are taking all necessary steps to confidently address those challenges. Richard Turner: As a newly combined business, we are perfectly positioned to provide the essential ‘added value’ that our customers are looking for when investing in new technology for production and workflow optimisation. The term ‘added value’ really means the combination of leading products and technology, along with dedicated and knowledgeable support staff, both pre and post-sale. By combining the very best elements of Canon & Océ into one newly combined organisation, we are able to offer an unrivalled proposition to our dedicated customers. Since May, we have been working in partnership with customers to help them overcome the business challenges they’re facing, allowing them to realise and utilise the opportunities that potentially exist for them. This could be finding new customers, developing new revenue streams, increasing application range or improving customer retention. By taking this in-depth, consultative approach, we are able help customers make an informed decision when investing in new print technology. The integration has put us in a much stronger position to be able to meet those needs. Chris Aked: As the leading manufacturer within continuous feed printing, Canon is now able to satisfy the digital printing needs of its growing customer base through the application of Océ technology. The combination of Océ’s heritage and knowledge within the continuous feed market, coupled with Canon’s reputation for innovation and R&D, puts us in a prime position to be able to both guide our customers on their personal path to profit and to strengthen our position as the number one leader of continuous feed technologies. The integration came at the perfect time for both organisations and it has allowed Canon to grow through the acquisition of Océ technology and expertise. Our aspiration is to take customers on a journey, helping them to realise the true potential that exists within their business. Mike Bianchi: Canon Business Services (CBS) is the management consultancy and business process outsourcing division of Canon. The integration of Océ into the Canon organisation was essential to the growth of Canon’s business services offering and has since allowed us to offer an enhanced end-to-end outsourcing service to our customers. Since integration, clients are now able to handpick a precise combination of services specifically to suit the demands of their organisation. Today, business data and documents are critical to financial and strategic decision-making. They are essential assets that play a vital role in the successful daily operation of an enterprise. Our services combine Canon’s proven technology, innovation and a comprehensive understanding of business process outsourcing with seasoned experts applying best practices to improve our customer’s bottom line. What can the market expect from Canon UK in 2014? Richard Turner: As the wide format print market continues to grow and expand across diverse segments such as industrial printing, I expect to see increased investment in new technology from ambitious, forward thinking organisations. I’m pleased to say that Canon will undoubtedly be at the forefront of that movement as we look to expand and develop our already broad portfolio of products and services to help our customers. We will be bringing full commercial availability of the brand new Océ ColorWave 900 in 2014 (as seen at FESPA), presenting exciting opportunities for professional printers to set new standards in the world of poster production. Mike Bianchi: We have seen a massive increase in how businesses are striving to better understand and improve the way information flows throughout their organisation. We expect to see this trend continue as organisations seek advice and innovation to identify and release the latent value within information and media. Canon Business Services are driving this conversation of change and are looking to deliver true business transformation. We are seeing that the economic downturn has given clients a stronger mandate within their businesses to drive change, particularly within process efficiency and operating model refinement. Our Digital Operating Model focuses on helping clients leverage their document infrastructure to enable them to seize these opportunities. We assist clients in process analysis and design, digitising those processes, often linking to cloud based solutions, and driving change to ensure the business benefits are realised. Mark Lawn: I believe that 2014 is going to be an incredibly exciting year for Canon and its customers. We will continue to invest in the development of new print technologies and service programmes, but what’s really important is for us to remain focused on our customers and their ambitions. As competition within the market continues to grow, it’s essential, now more than ever, for service providers to highlight the ‘true value’ that can be offered to buyers and marketers through print services. For example, Canon’s Business Innovation Scan assesses the current situation in customer’s business, and our Essential Business Builder Program looks at where the customer wants their business to be in the future. This consultative partnership will remain crucial in helping customers grow and transform their businesses. Canon will continue to develop upon these core programmes with the aim of providing greater insight into the opportunities that are available for customers to expand and diversify both now and in the future. Chris Aked: Canon will continue to place a significant investment in R&D allowing improvements in Canon’s market-leading continuous feed products among its other core technologies. The transition to white paper in the transaction and direct mail markets will accelerate as the quality, speed and prices improve. Additional growth will be seen in the commercial print market as the adoption of digital colour continues to rise and as more books and manuals are transferred to digital inkjet technology. The number of digitally printed colour books will also increase as publishers move titles to an inkjet platform as the quality and papers continue to improve. Workflow will be a key driver for many of these changes, with automation providing the largest savings for our customers. As such, we will see an increase in security features protecting documents and enhancing their value. UV inks, void pantographs and microtext will all feature as added-value features on our inkjet technology platforms to support our customers in doing more with less. Our latest technologies will open up new publishing and collateral applications. All of this will help our customers offer the most extensive and value-added services to their clients. There are opportunities for our customers to grow and expand and it’s our job as Canon to help them to realise those opportunities and to take advantage of them. The integration may be finished, but this is only the start of a long and exciting partnership that we will take with each and every one of our customers moving forwards.